Booklice are small insects which love moisture. In general, they need to live where humidity is high or moisture is present. 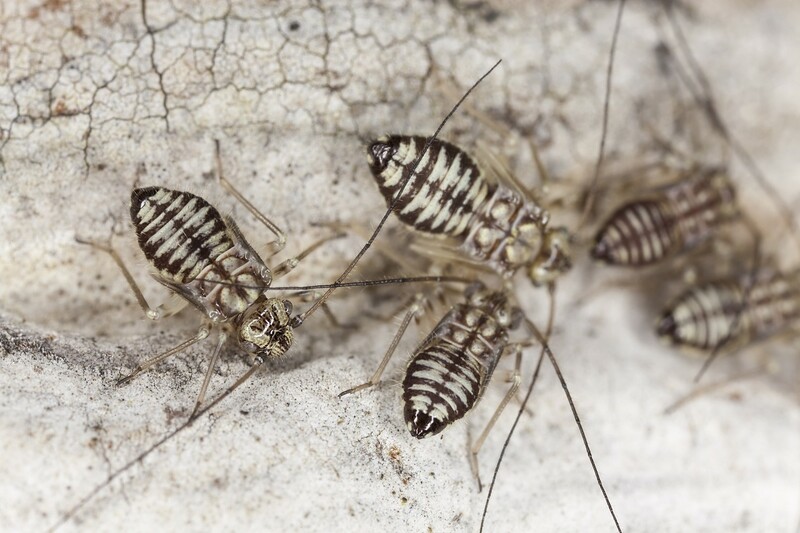 Common places for booklice populations to thrive include window sills, under outside siding of homes, tree trunks, shrubs, flowers, around garden hoses, under bricks and rocks, around light fixtures and under boxes. However, some species will readily live in books, book cases, attics and crawl spaces. In fact there are many families and subspecies of this insect and the science community has not quite come to a concise conclusion about how to group and name all that are included. Some appear to have specific moisture requirements and others do not. At the same time some seem to be food specific and others do not. To make matters more confusing, it appears that booklice are able to change their dietary needs as food availability changes. One thing is for sure: if you have booklice active in or around your home – expect them to prosper and keep coming back every warm season. And in most cases they’ll end up invading living spaces which is when they’ll readily invade books, file cabinets and basically anywhere they find paper products. Booklice hatch from eggs in about 2-4 weeks after eggs are laid. Young will go through 2-4 nymphal stages to reach adulthood which takes another 2-3 months. Once mature, females can generate 50-100 eggs during her life and as an adult she would expect to live 1-4 months. Most populations will produce 2-3 generations per year but there could be a lot more if conditions are right. Booklice are able to adapt to their environment which will dictate just how fast they reproduce. In general, the more moisture and the more moderate the temperatures (50 -80 degrees) the more they will prosper. Cold weather (below 35 degrees) will kill off adults but eggs will live and be ready to hatch as soon as local temperatures get back to where they are comfortable. Booklice will eat just about anything. Though most people think they eat books or paper, in fact they can thrive on a wide range of food. Typical food in the home include cellulose products (paper or books), book bindings, fabric (from which many book bindings are constructed), glue (the glue that binds most books has many natural components), contact paper, wall paper, any type of grain, mold, mildew, algae, fungus and other plant life. The fact that booklice will readily live in books is the same reason they will readily live on trees: the presence of both cellulose (paper is made from wood) and fungus or algae. Algae or fungus will readily grow in damp dark places inside homes but it also thrives outside. It is here where local booklice populations will begin to accrue. Most all booklice problems start from the homes siding. Booklice which forage onto homes and establish themselves on brick, stucco, hardy board, cedar shakes or underneath coverings such as vinyl or aluminum will eventually end up inside. From outside the home they will commonly find window sills to be great for food as well as outside light fixtures, outlets, door frames, etc. The author has seen them thrive on just about any perimeter location of most any structure which gets wet during rain or irrigation. Such areas have a tendency to harbor moisture and this harboring is what enables fungus and algae to grow. Once this growth starts booklice will follow and once established on the structure, its just a matter of time before they end up inside. The good news about booklice is that they are slow eaters. This means damage from local populations is usually minor unless populations go unchecked for long periods of time. However, booklice are both annoying and persistent so most people don’t want them around. Fortunately, they are easy to kill and with the right products being used its relatively easy to manage or eliminate activity in and on the home. Since booklice will be effectively hiding out of sight once they get inside the home, it can be hard to isolate all areas where they’re nesting. For this reason aerosol products are a good formulation to use where activity is found. If you have large areas to treat like a wall, a book shelf, cabinets or storage boxes, PHANTOM AEROSOL is a good product for the job. It doesn’t kill them quickly but this very much by design. Basically as they forage over treated surfaces, they’ll be picking up small amounts of the Phantom which is then brought back to their nests where its effectively “shared” with other booklice. This in turn will cause the whole nest to die in 2-3 days. Spot treat around windows, doors, baseboards and walls where you see them active. It also comes with a crack and crevice injecting straw so you can direct the treatment into tight areas where they like to hide. When used properly, you should not be be seeing a “wet” look where you spray so there is no need to over due the application. Just a light mist will get the job done. For small areas 100 sq/ft or less filled with paper products that are difficult to spray, installing AEROSOL MACHINES with CLEAR ZONE metered insecticide will make treatments automated so you don’t have to worry about constantly treating. These machines are well suited for small paper closets, rooms with boxes or bookcases filled with books. The aerosol refill will be releasing small 1/2 second “blasts” of a pyrethrin based aerosol strong enough to kill booklice. The key to the success of this treatment is that the aerosol released will be in ULV form. That means the aerosol will be comprised of very tiny microns of active ingredient. These tiny microns will penetrate cracks and gaps where booklice like to hide so they won’t be able to avoid the spray. The same impact can be achieved using the PT-565 listed above but with the machine, the treatment will be automated so you don’t ever miss. This will insure long term control. Each machine is set to go off every 15 minutes and is powered by 2 “D” cell batteries. Set one machine above the area you want to keep booklice free so either mount it on the top shelf of a wall unit or on the wall above the books or boxes. Cy-Kick CS will provide a quick knockdown and a long lasting residual which will prevent hatching booklice eggs from thriving. Cy-Kick CS can be applied over the homes exterior siding, around windows, on trees and plants and just about anywhere booklice activity has been found. Once you decide on which product to use remember to stay with it and make applications throughout the season as needed. Generally speaking, infestations which are located outside will be active in the warm months and go dormant if you have a winter. For the southern most states, it is not uncommon to have activity year round. Most of these outside applications should be done with PT-Cykick CS. If you have booklice in the home or building and have decided to use one of the Aerosols, expect to do several treatments since these applications will not last as long compared to the liquid. To help monitor the problem and cut down on their activity, install BOOKLICE TRAPS on all bookshelves, countertops and window sills with activity. Its also smart to set these out where you suspect they might be nesting. This could be around a shower tub, toilet bowl, inside plant pots, area rugs or under furniture cushions. They measure 4.5″ wide by 4.5″ long and less than 1/2″ tall so they’re quite flat. Each trap features a unique food lure booklice love and will forage several feet to get inside. The design of the trap is unique so be sure you set it up correctly. Basically the bottom of the trap will be the side with the 8 holes and “grooves”. The grooves should be facing the ground and will effectively “funnel” the booklice to the holes. Once they enter, they’ll get stuck on the non-drying glue inside. Booklice can be a persistent and annoying pest in and around the home. Though they don’t bite, their chewing mouth parts can cause a lot of damage to fabric, books, wallpaper and other inanimate objects around the home which are valuable. Reduce moisture levels to deter nesting and seal cracks and crevices where booklice may be entering for long term protection. I have a very large, old country home and I was going to use the PT-CYICK and spray the basement and upstairs, on the walls and counter tops. I was then going to follow up with the PT-565XLO aerosol. My question is, is it safe to spray on surfaces that I prepare food on? The booklice are on my counter and table and walls. Would it be alright to use this spray were we eat our food?? @Valari Fanson: In general, we never recommend direct treatment to food prep countertops, shelving and other such areas in kitchens. And in most situations, there is no reason to treat open areas because most insects won’t be living out in the open. Yes, we know several pests will walk over these areas including book lice. But the important places to treat are the cracks, crevices and spaces where they tend to nest. That being said, when treating such areas you should either cover the countertops before and during the treatment or wash them afterwards. Most people will treat cracks and crevices around the countertops and then wash afterward using any kitchen cleaner and a rag. PT-565 uses pyrethrin which breaks down easily even if you didn’t wash so use it anywhere close to the food prep areas. And after you wash the counter following the treatment, the area will be safe for normal use. In summary, I recommend using the Cykick for the basement, walls and other areas outside and around the kitchen. For the kitchen, stick with the 565 and you’ll be fine. Hi, I wish to know if any of the above insecticides will result in moisture seeping into the wood and promote mould growth? In addition, after spraying them into the crevices, can I caulk up these crevices using clear silicone? Thanks! We recommend a “light” treatment if you’re using a water mixed solution. This way there should be no chance of mold or other issues arising from the treatment as this would be counterproductive since booklice live on mold, etc. And really, a light mist is all that is needed treatment wise anyway so there is no need to overspray. As for cracks and crevices, if you have a lot of these and are mostly wanting to focus your treatment on them, the best product for the job would be the Phantom aerosol. That’s because this product goes on “dry” and leaves no moisture. Plus it has a long lasting residual, is odorless and ideally designed to be “caulked in”. In other words, caulking up the cracks after treating would be very smart where you can do so and for all such locations, the Phantom would be a good product choice. Can I use the spray on the kitchen walls? That’s where they are the most. The PT-565 can be sprayed over this area in a light, misting method. But really you need to get them where they’re nesting and thriving. This will be in cracks and crevices around the room. And for this treatment, the Cykick would be best. Hi and Thanks for all the info. My question is am I looking for a nest or colony? I find them all over my bedroom so do I have a mold problem on the outer walls and do I just presume they’re living and reproducing by the mold? How do I hunt the source? Please help as my newborn is in my room with me. With booklice and psocids, there is no “main” nest. Typically they’ll live close to moisture hiding in cracks and crevices alongside the worse areas of the problem. And like many other pests, once they get populated enough, they’ll migrate out into the surrounding area and no doubt this is what you’re experiencing now. To get control of the problem, you should treat with some PT-565 around the most likely entry points which is usually the exterior walls. The focal point should be the windows. This is especially true if you’re not opening some of the windows. Closed windows will typically harbor a lot of moisture and psocids love these locations. Hi. I also am having a psocid problem. They haven’t migrated into our home yet, but they are attempting it as I have found them crawling around our doorways attempting to come in. My main problem is they are all over the outside of our house on the vinyl siding. The numbers aren’t too bad, but it is a lot more than I’ve noticed in years past. I am looking at getting some of the PT-Cykick CS and spraying down our house. I am wondering though; we live in a notoriously damp part of town. Is our yard the main source of our problem? When it rains, our yard stays moist for quite a while and it has rained a lot this year. We put down yard granules so could this have driven them over to the house? I’m hoping we don’t have mold growing under our siding. I have not ever seen them this bad in the 4 years we’ve lived in the house. Maybe the mild winter we had is causing this. Psocids are very easy to control and they don’t do well trying to migrate. So if the lawn was the source of the problem, the granule treatments would easily take care of them. That being said, I don’t think the yard is the source of your psocids. What I’m fairly sure is happening is that you have issues under the vinyl siding. I’m 100% sure that this area is providing a lot of moisture, mold and algae. All of these will commonly thrive under most any vinyl sided home and in most cases I’ve seen it get worse and worse from year to year. And since properly treating with Mold Blaster and Mold Block would require removing the siding, it’s not a practical solution for your home. But there are two things you can do which will really help. The first would be to spray the Cykick CS on the siding. This would no doubt kill the foraging psocids as they came out of hiding and tried to walk on the siding. But you’ll need to spray every month to keep on top of the problem and you’ll need to spray all four side of the home as well meaning you’ll be using a lot of material every year. Also, this won’t be getting them where they nest which is really what you should try to do. So what would be a more thorough solution would be to dust under the siding using some Diatomaceous Earth. I’ve used this method and though time consuming, I found it works very well eliminating everything that wants to live under the siding including wasps, bees, ants, roaches, psocids and anything else that might crawl under it. To use this method effectively, you’ll have to dust a little under every bit of the siding. I found that by blasting 2-3 squirts under a section and then moving over 3 feet and repeating the process, I was able to dust every row of siding all the way around the homes I worked on. I commonly use a Hand Duster for the treatments close to the ground that I can reach and then for the upper sections of the home, I use a Dustick. And yes, you’ll need to do every row to get the siding thoroughly treated but again, it’s well worth the effort. Good luck! True this will take a little time and effort but rest assured it’s worth every bit. DE dust will stop psocids and I’m sure the area under the siding is a major problem that needs to be addressed and this is the most practical approach that can last a long time too. Basically you may only need to do it once in the spring and at worse, every spring and fall and you’ll be fine. As explained in our article above, psocids are quick to rebound following any treatment and unless you’ve sprayed the surfaces on which they’re active, expect them to return a few days following any treatment. This will happen over and over unless you get their nest site. So to solve the problem for good, you must remain persistent and treat as many areas as possible understanding that they can be nesting on the walls, around windows, under window sills, around doorways, around sinks and basically everywhere but the baseboard. What we find with most service companies is that they’ll only spray the baseboards and this will not work when it comes to psocids. So if you’re ready to start doing some treatments on your own, get the PT-PI aerosol for quick killing action. It’s a pyrethrin based material which will kill on contact and repel psocids from treated surfaces. But it won’t last but a few days so expect to use it several times a week until you find and kill their nests. PT-PI is gentle and can be sprayed over large areas which is handy when psocids are being seen all over. But to solve the problem you really need to treat all the cracks and crevices where they might be nesting and though the PT-PI can do the job, Dforce Aerosol is a stronger, longer lasting option. It comes with a handy straw to help direct it into all the areas where this pest is likely to hide. Get these two products and start using them throughout your flat and I’m sure you can eliminate this pest with a little persistence and hard work. I am not sure if these are what I have. I notice them more at night. They are flat and very tiny insects in my window sills and I see them on the siding of the house. I need to know if these are what I have so I can get the problem taken care of. There are many small insects that people call booklice which tend to infest the same areas you list. The short list of related pests includes springtails and psocids but there are others too. The good news is they are all easy to control and regardless of which one you have, the treatments listed above and in my response to you will take care of all of them. So for the window sills, we recommend using the Phantom aerosol inside. It’s odorless, goes on dry and won’t make a mess. The only drawback is that it won’t work instantly meaning you’ll still see activity for a day or two following the treatment. But once it kicks in and starts working, the treated area will remain pest free for 2-4 weeks. Retreat as needed. Now if the wall void under the window is getting damp inside the wall, dust this space with Deltamethrin Dust. Booklice, psocids and springtails will readily live inside wall voids where moisture accumulates so if you’re only treating the outer surfaces, they will continue to nest and thrive out of site which will allow of a never ending flow of new ones into your living space. To treat this area, make small holes in the wall and inject the dust using a hand duster. This application is long lasting and only needs to be done once a year. Now all three of these pests come from outside areas like house siding, pine straw, thatch, grass and basically any place on the ground. And once these populations get large enough in any of these areas, they’ll migrate with some ending up inside. So to stop this kind of invasive migration from any of these pests, you’ll need to treat the areas around the home. And to start, you should apply some Bifen Granules. These are long lasting and over time will seep down into the soil taking away this prime nest location. Next, spray over the top of these areas with one of the following: Cyonara RTS, Permethrin RTS or Bifen XTS. All three of these will work and the only distinction between them is that the Cyonara and Permethrin comes with an included hose end sprayer so you only need to hook it to your garden hose and start spraying. These two are good for small yards. The Bifen XTS is highly concentrated and will need it’s own Hose End Sprayer but it can cover a much larger area making it more economical for anyone with a large lot or a bad problem that will require a lot of spraying. Links to all three products are on the Cyonara RTS page along with the Hose End Sprayer needed for the Bifen XTS concentrate. Be sure to spray the liquid as needed meaning if you’re finding activity outside every 2-3 weeks, spray when they come back. And treat at least once every 6 weeks to avoid future activity. I have booklice living in my air conditioner. What do I do. It is not one that I can remove. If you read our article above, you’ll learn the first thing you need to do is take away the booklice food. In fact air conditioners are one of the more common locations booklice like to live because these units are filled with moisture and grow all kinds of algae and mold which booklice need. So if you want to keep your unit free of this pest, you’ll need to keep it clean and treat it on a regular basis. To clean it, shut the unit off and wipe it down with the Rough and Ready. Try to get inside the unit as much as possible. Now there is no need to soak the unit; just wipe it down getting as many “internal” areas as possible. Next, spray the unit down with either the PT-565 or the PT-Cykick. This needs to be done weekly during the summer months and once a month in the off season. And which to use will depend on the season too. So if it’s the summer and you are using the unit, wipe it down with the Rough and Ready weekly. Next, let it sit for an hour to dry and then treat it with the PT-565. Let it sit for another hour and then you can go back to using it like before. The 565 would be the product to apply during the time of year when the unit is running a lot. In the off season when the unit isn’t running, clean it every month or two but treat monthly with the PT-Cykick. This is a stronger formulation compared to the 565 and will provide a long lasting residual which is why you won’t be using it as frequently. The 565 will be gone within 20-30 minutes which is okay if you’re using the unit for safety purposes. But because it has no residual, you’ll need to do it on weekly schedule to stay on top of the problem. Thank you for answering me. Please may I ask you another question. I live in Manhattan. I have never had any bugs so I was not “looking” for any. By the time I noticed these tiny bugs, they had invaded my desk which was in front of the air conditioner. They have invaded my printer and my fax machine. I put both in black garbage bags sealed as we speak. Do I need to throw them out? It is a professional printer and was rather expensive, but I WILL throw it out if you tell me I have to. Also can I spray into outlets as they seem to be living in the outlet I was plugged into. I am a wreck. By the time I even noticed them, there was a swarm all over the floor leading away from the desk area. I will tell you I am in tears as I write this. WILL I EVER GET RID OF THEM? EVERYTHING I HAVE READ BEFORE FINDING YOU SAYS THEY HAVE THEM FOREVER. So very upset. Are they living in my (dry) carpet now also? I can’t tell. As our article explains, booklice are about the easiest pest to control so there is no reason to have them any length of time. The key is treating thoroughly and to keep treating. Most people treat a few times, get control of the problem and then give up thus allowing them to return. Since booklice exist all over, you actually never get rid of every one any given structure might hold. But when there is only 1-2 you’ll never see them. The problem is when you have thousands and that’s what you’re trying to prevent. And there is no need to throw anything out. Simply wiping them down with the Rough and Ready as well as treating lightly with the 565 will keep booklice in check. And any wall void where you find them active like the electric outlets; you should definitely dust them with some Pyganic Dust and a Hand Duster. This treatment will last a year so you don’t have to do it frequently. And you should apply some under every switch plate cover, electric outlet, light fixture, etc. Thank you. So if I understand you, I do not need to treat the carpet? Actually, if you are seeing activity coming from the carpet, the liquid Cykick should be applied using a standard Pump Sprayer. This would be needed every two months. I have a book lice problem in my bedding (mattress, blankets, and bed sheets), which is an area not commonly associated with booklice based on my internet searches. I’m wondering how to treat mattresses and bedding. I’ve tried washing all of the bedding in hot water and drying it thoroughly in the dryer but the booklice still appeared. Now I’m considering buying a plastic covering for my mattress and box springs, similar to what they use for treating bed bugs and dry cleaning all of my sheets and blankets. Would this be effective in treating book lice found in bedding? I live in a dry, desert climate but will also purchase a dehumidifier since my bathroom is en suite. Are there any other recommendations that you can make for treating bedding? Booklice appearing in bedding is actually quite a common problem. Remember, the human body will release moisture and heat which is what booklice need big time. And there will be plenty of food in this area from the skin and hair shedding that naturally occurs. Furthermore, most mattresses contain fillers which include natural ingredients which “decay” over time. This decaying, organic process is ideal for many pests including booklice and one of the main reasons they can be problem in the bed. Now once they’re seen in the bedding, it usually means they’re nesting in the mattress. To eliminate them, you’ll need to first remove the bedding and treat the mattress with the PT-Microcare listed above. This should be done weekly. The bedding will have to be washed at least that frequently. Pay particular attention to any part of the mattress that has deep folds, seams, holes, buttons, etc. which may be allowing the booklice to pass from inside to the outside. Any route of entry like this should be treated extra well. Try to direct some of the Microcare inside the mattress too as this will help get them where they’re most likely nesting and reproducing. The insect I thought were booklice were identified by an entomologist at my pest control company as springtails. I think this is correct since I noticed that the insects in my home were quite jumpy, almost like fleas, but I had read that booklice don’t jump. I’m still confused as to how they are living inside of my home since I live in a desert climate and the relative humidity inside of my house, including near the bathrooms and kitchen, (measured with a hygrometer) is often in the 20-30% range. 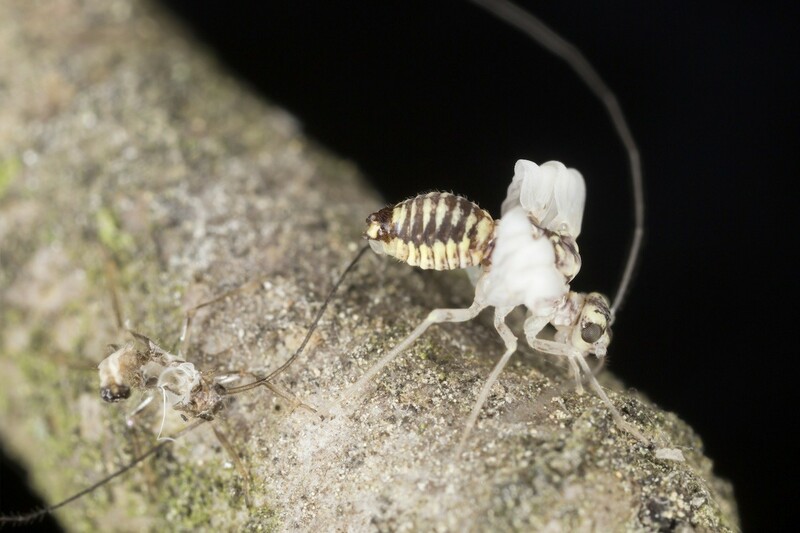 Is the treatment you recommend for booklice also effective in treating springtails? Last night as I was getting ready for bed I looked under the bathroom sink to get something and noticed very tiny flesh colored bug. I took everything out of the counter and sprayed everything down. I sprayed the counter, the floor, the walls, even the doorway leading into our bedroom. Today my husband sprayed our whole house molding on top and bottom, floors, windows, doorways. I haven’t seen them anywhere else in the house. What do I need to do to to keep them OUT of my house. We have an old house and we spray every 3 months to avoid this problem. Did I find them in time to keep them from spreading throughout my house? As explained in our article, booklice are extremely prolific and can spread quickly. The key to stopping them inside is to get them on the outside of your home before they enter. And that’s because once they’re living and thriving around windows, under the house siding, on decks and even on your rain gutters, it’s just a matter of time before you start seeing them inside. So for starters, I suggest you start using the Cykick Concentrate listed above. It’s very active on book lice and should be applied to the exterior of the home every three months. It can also be used inside so change to the Cykick. It will be stronger than any common over-the-counter product you can find and easy to apply. Next, get a can of PY-565 or PT-Phantom and keep it around for quick treatments when needed. I actually inspect my home 1-2 a month looking for ants, crickets, springtails and psocids. Since I live in a region of the country which is humid, many pests will thrive on my house if I don’t treat so I actually mist my property and home every 2-3 weeks to stay ahead of any problem. This also handles my mosquito and gnat problems which is why I do so many treatments. But if you’re only worried about crawling pests, treating every 2-3 months with the Cykick should keep all of these invasive pests under control. Just remember to open every window you have and treat where the window meets the sill as this is a common location for booklice to thrive and must be treated regularly with 565 or Phantom to keep them away for good. I have booklice everywhere in my ground floor flat which is owned by council. Its an old cornish unit building. It’s very damp. They are in my sofas, beds, wardrobes, clothes, walls, cupboard under the sink in kitchen and food cupboard. They are driving me mad. Can you help please? The council won’t. Thank you. Not sure how we can help outside of informing you of what’s needed to control this pest. And for that, just review the article above because it covers all you’ll need to do. The good news is that booklice and psocids are easy to control using the products we have listed in our article. Based on what you’ve described, I would say you’ve got a significant problem that will need extensive treatments. For starters, wiping down any hard surface around any windows, the exterior house siding, moldings and interior walls with Rough and Ready will no doubt help because it will sterilize the area taking the required food this pest needs away in the process. Once cleaned, the outside of the unit needs to be power sprayed with Cykick CS. This can also be applied inside the flat, along baseboards and other routes of entry, and even on your carpeting and furniture if you’re finding pests throughout. Next, spray every exposed surface spot you see them active with PT-565. This can be applied as often as is necessary so if need be, you can treat daily. Using this approach you can eventually kill off all active adults and once their eggs run out, the infestation will be gone. Most people will treat sensitive areas with the 565 just before they leave for the day. This would include bathrooms, bedrooms and kitchens. Conversely, in the evening, great rooms and other areas of the home should be treated with 565 right before you retire for the night. Follow this routine daily till you don’t see any and then once a week when they’re in season to prevent them from re infesting the flat in the future. We live in Southern California and our entire home is infested with booklice. We had our local entomologist identify them as our local pest company claimed they couldn’t do anything for booklice. We are desperate for any suggestions and what spray to use. We have been fighting this infestation for over 4 months now and they are in every room all over our furniture and some window sills etc… We have no idea where they are coming from but I’m assuming from under the baseboards, behind the walls. What products would you recommend for us to use throughout the entire house? My fear is that they have also nested in our furniture, bed, books… I’m scared that we will take them with us when we decide to move. Any suggestions? Thanks so much! No need to fear bringing them with you as long as you start treating as explained above. Booklice are easy to control as long as you do the work so there is no reason to keep the infestation you have. Most service companies won’t commit the time to the job which is why they “couldn’t do anything for booklice”. Basically it involves treating as many cracks and crevices with the products listed above and though type of pest control can be tedious at times as well as time consuming. For this reason most service companies won’t commit the time needed to solve the problem because it’s not a cost effective way to run a business. Most importantly, this is the only way to take care of local book like infestations like you describe so if they’re not willing to do the work, you’ll have to. Fortunately it’s easy. So for starters, I suggest you review the article above. It talks about several products that can be used and goes into good detail on how they should be employed. Basically you should start by spraying the outside of the home with Cykick CS. This should be done every 2 months. Expect to use 2-3 gallons of mixed solution per treatment and apply it with any standard pump sprayer. Next, you’ll need to spray inside the home with Cykick Aerosol. 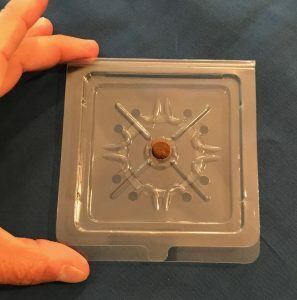 This comes with a special injector tube which you’ll use to get the product deep into cracks, crevices and wall voids where they’re living and hiding. The areas you’ll need to treat will include behind molding, baseboards, door frames, etc. And don’t forget to lift any window that can be opened and sprayed under. The area where the window sits is known as the “window seat” and one of the more common areas where book lice will thrive. From there they’ll migrate inside homes so getting them at this key point is important. Lastly, get some 565 aerosol for open area spraying. It’s a quick kill type product that can be applied to large open surface areas where you see the book lice roaming around randomly. 565 doesn’t last long so it can be used daily if needed both inside and outside the home, basically for spot treating, and one way to quickly reduce what’s active. But it’s not a solve all so don’t rely on it alone. Use the Cykick Spray and Aerosol for long term control and ultimately eradication of this pest. @Tech Support: Thanks so much for your reply! I will definitely get those products you listed above. Is it safe to assume that if booklice are all over our furniture including couches and beds that they have nested there? Since they are literally in every room on almost everything, should we spray each book/item with 565 before packing it up to move? It seems tedious to have to go through all our things but we really don’t want to take those critters with if they are nesting/hiding in our belongings. Also, our home inspector mentioned that our home has moisture in our under the home crawl space (both neighbors also have this issue). No leaks though, but it seems like a perfect breeding area for them as it’s both dark and moist. Will spraying outside of home and inside baseboards/windows eventually take care of the booklice infestation or is it a matter if figuring out exactly where they are nesting or spraying under the house too? How many cans of Cykick would you recommend for 3 bedrooms, 2 bath, and 2 large living rooms? Thanks again!! It’s always better to “assume” the worse case scenario. This way after you get everything treated, in theory you should have it covered one way or the other because you will have treated most everything leaving no place for them to hide. No doubt this will be a bit more tedious to do but well worth the time and effort. As for your crawlspace; I’m sure it’s a significant factor contributing to both the moisture needed by these booklice and it could even be where they’re breeding. With that being said, I would recommend you get a good liquid application done to this area. By treating it thoroughly, you’ll be eliminating it as a nest site. But since the moisture coming from it will still be permeating upstairs, just treating the space alone won’t solve the problem. I say this because the book lice will be able to derive plenty of moisture upstairs without having to go into the crawl and for this reason, treating all the baseboards, furniture, etc. upstairs will be required too. Now for how much you’ll need? This will vary from house to house based on the size of the structure. But each can of 565 and Cykick will be enough to treat the home at least once. A good guideline to follow is for mild infestations, each can should last 4-8 treatments. For bad problems, more like 2-3. Good luck! @Tech Support: Great, thanks! We’re a bit relieved after reading that you say it’s pretty easy to get rid of them. Last question – is the 565 safe on furniture such as couches, beds etc… and is the Cykick safe on hardwood floors? Thanks again! Very thankful we found your site. 565 and PT-Micro Care (another pyrethrin based aerosol) are both fine for directly spraying the furniture. Now since you mention you have hardwoods, I’d say to get the Phantom over the Cykick. I say this because I too have nothing but hardwood floors and use Phantom over most any other aerosol. I use it for one main reason: it goes on dry. That means you can’t see where it’s been applied which makes it “cosmetically” a better choice. Cykick can get “wet” if you over apply it and in fact, this can happen with most any aerosol. So on hard surfaces like linoleum, ceramic tiles, hardwood floors, etc., the Phantom is better suited. Plus it’s odorless. Read through the article and all comments. We have booklice throughout our entire home. Sounds like for inside the house we need to spray Cykick first on all baseboards/windows and cracks. Is that correct? Then spray immediately after with pt-565? Is the pt-565 supposed to be used in the same way as Cykick (baseboards, cracks etc…) or is it more of a fogger that you spray in the middle of the room? The product label says to leave windows/doors closed when spraying which is why I’m confused how to use this product as I thought it’s better to ventilate the room. Also, we have booklice in pretty much everything we own (books, picture albums, couches, beds) – what can we do to get rid of booklice on such items without them being ruined? Thanks! I definitely understand your confusion; hopefully this will help. The Cykick is for cracks and crevices only. Since booklice will live and breed in such spaces, using something like Cykick is best because it will leave a residual that can last a few weeks. This is the primary reason why you should use it for these important locations over the 565 which will not leave any residual where applied. Now the one problem with Cykick is that if over applied, it can leave an “oily” film. This is why it’s not labeled or surface treatments but rather cracks and crevices. Mind you the film is not dangerous but on sensitive areas like books and fabric, this can be an issue so don’t use it for general spot treatments. But since booklice can be found out in the open, it’s best to spot treat with something that won’t affect the surfaces and the Pt-565 is ideal for this need. It only takes a little of the product to impact any booklice out and about foraging so a light spray of 565 can be effective at knocking out a bunch in little time. Now compared to PT-PI, the 565 is about the same only a bit faster acting. Neither will leave a residual like the Cykick but both the PT-PI and 565 can be used in open areas with the 565 no doubt being a bit “stronger”. Hope this helps; give us a call toll free at 1-800-877-7290 if you need further assistance. Also, what is PT-PI for? Noticed it’s also for booklice but seems you recommend Cykick and PT-565 instead? Thanks for clarifying. I believe I answered this question above..
We have a book lice issue in our current home and we had one in our previous home. They can be seen in all rooms, on walls and on floors. We keep low moisture levels and a dehumidifier going even in the cold winter months. Our humidity in the house is in the 30’s and they are still around. We don’t know where they are getting in. We have no signs of mold or leaks or moisture issues in our 1 year old home. We keep all plastic bins up off the floor in our unfinished basement. We keep a very tidy house because of these things. Right now during winter we are seeing them mostly in the basement and in the open stair case coming up. We just cannot figure out where they are getting in. I am seeing 10-15 a day right now as I check with my flashlight. In our previous home which was only 4 years old, we sprayed foam in the sill boxes thinking they were coming in there but it didn’t seem to improve. What can we do to finally get rid of these things??? I am just very surprised we are still seeing them in the cold midwest winter time. Most insects come in from outside the home and some can enter through the smallest of cracks. Book lice do both. They are found throughout every state here in America and once they start nesting on any manmade structure, they’re able to use every available entry point to get inside. Now during the summer months they might not be so noticeable because the bulk of the population will be foraging out into the yard to eat. But once it gets cold, they’ll “tunnel” through the walls seeking the warmth. At this point it’s safe to say you have this is happening on your home right now. Unfortunately, trying to “seal” them out will not prove effective. This is largely due to the fact that book lice can enter through the tiniest of holes. And sealing every entry point is not possible. Additionally, the moisture level inside the home (as well as the “cleanliness” of the home) have nothing to do with whether or not you develop a problem. The bottom line is that every home on which a population of book lice is allowed to live outside is basically at risk at seeing them inside. In other words, it’s just a matter of time before the problem migrates to the inside of wall voids of the home and from there, into living spaces like you have happening now. So at this point it’s apparent you have nests living throughout the home. These most likely started outside under the homes siding, roofing, behind facia boards, around window and door frames, etc. Book lice nests start small and typically form “pocket nests”. These nest might harbor 25-50 and once they get to this size, some members of the nest will migrate out and away creating new nests. Eventually some of these new nests will end up in the wall voids of the home and since these spaces will be dark, moist and protected from the cold, book lice will be active all year long. Now trying to treat everyone of these spaces is not a practical approach to controlling the problem. But there are two things you can do which will eventually kill off these populations. The first course of action that will get rid of book lice is to start doing some treatments. So to know where to treat, start taking note of where you’re finding these 10-15 book lice every day. And remember, they don’t forage far from their nest site. So where ever it is you’re seeing them, there must be a nest close by. Book lice can live under carpeting, appliances, in couches and other furniture, under sinks, around refrigerators, etc. In fact, the next time you find one “out and about”, don’t kill it. Instead, just watch it awhile and I’m sure it will trail back to it’s nest site and eventually show you where it’s living. Keep in mind these sites will be very small and the entry way to where they’re hiding might be a crack that’s almost too small to even see. But once you start finding these locations, all you’ll need to do is treat them with some Phantom. Phantom aerosol lightly misted over the area where you see the activity as well as into any nearby cracks or crevices will take care of this area. This treatment will last several weeks and within 2-3 days, kill any living in the vicinity. Now over a 1-2 week period, you should be able to eliminate most of the local “inside” nests and if you keep persistent with these localized treatments, you should be able to get rid of most all book lice that are active inside the home within a month. But once it starts warming outside, you’ll need to take a proactive stance on the homes exterior if you want to get rid of this pest for good. Since book lice will start to forage outside as the temperatures warm, the homes exterior will need to be treated with some Cyonara RTS every month. By spraying the siding and the ground around the home, you’ll put in place a protective barrier that will not allow book lice to be active on the treated surface. This means any migrating out of the wall spaces will die. And if you spray the ground around the home (coming out around 5-10 feet to treat any grass, mulch, rocks, etc. ), they won’t be able to find their way back inside. So between the inside Phantom treatments and the outside Cyonara treatments, the book lice population on your home will eventually die off an disappear. So how long will this process take to complete? Probably 4-6 months. But once they’re gone, if you keep treating every month on the outside of the home, you shouldn’t get any inside so in the end, this kind of preventive protection is the best way to proceed for long term control of book lice. Hi, I have a whole bunch of these booklice in my moldy bathroom. They’re on the walls and ceiling and there is 2 corners where many of them line up and crowd up. My bathroom has no windows, no exhaust and no fans so it gets pretty steamy in there during the winter when we have to use an electric heat and we keep the door closed until all the people (5 to be exact) have taken a shower. This usually takes about 2-3 hours; hence, the humidity can get quite high which I’m pretty sure is why the mold is forming. OK, so back to the bugs; which sprays/products are safe to be used in the bathroom and how/when to use the products? I would like to get rid of the booklice, then try to maintain it so to prevent them from coming back for the time being so I could look into getting a dehumidifier or have a fan/exhaust installed. Based on the current conditions (high humidity and mold) you described, there would be little if any benefit from using a residual product. In other words, any residual would just break down rapidly and the book lice will be able to keep coming back. So with that being said, I would say going with the PT-565 space spray daily should suffice. At least for now. Basically what you would want to do is apply some to the areas where you see activity after everyone has showered in the morning. The 565 doesn’t leave any residual, which is fine since nothing could last any length of time in this room anyway, but it will kill the exposed lice on contact. And if you treat daily, you should be able to stay ahead of the population so it will be kept minimized and barely detectable. Now to start, I would say to treat in the evening as well, just before you retire. This way you’d be getting them in the morning and then again in the evening which would be best. Eventually you might be able to cut back to just one a day but for the first week or two, try twice daily until they’re gone. The good news is the treatment would be easy to do (basically it’s like spraying hair spray) and if you follow this schedule, you should be able to keep their numbers in check. And if you do get some way of reducing the humidity in the room, you’ll be able to use one of the residual products which in turn would mean less treating. But this can only be attempted after the humidity has been dramatically reduced and no mold is able to grow. We have an issue with booklice, springtails and clover mites. Is there a product that will take care of all three inside the house and outside the house? And in the fall we get a lot of boxelders and some stinkbugs. Looking for a product that will kill and not repel which tends to just spread them around more. And something with long residual effect but yet safe for use around kids. And for outdoors; something that will hold up to the sun beating on the house and rain. Also a product we can treat the yard with. So I am guessing there are a few different products we will need to treat with but just don’t know what ones. If you look through our site, you’ll find we have articles on all the pests you mentioned. Additionally, you’ll find there will be a wide range of products listed to control them which will no doubt make the process sound complicated. The good news is that what we sell is what the professionals use and because these products are so good, you should be able to control your target pests with just a few key products. So here’s what I recommend. For starters, spread Bifen Granules around your home. This means in the yard, in any flower beds, pine straw islands or wood chip mulch areas. Bifen granules will last 1-2 months per application, work on a wide range of pests and are safe to be used where people and pets are active. Next, spray Cyonara RTS over the top of the Bifen. It comes in a handy garden hose sprayer so all you need to do is attach it to your garden hose, turn on the water and start spraying. Next, get Bifen concentrate and spray it on the homes siding. It’s odorless, works on just about everything and will last 1-2 months per treatment. 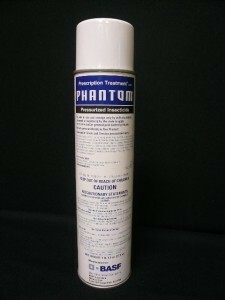 Lastly, get some Phantom aerosol for use inside. Treat baseboards, molding, door frames, etc. by using the straw injector. Phantom is odorless, works on just about everything and goes on “dry” making it a great choice for use inside. Each of the links above will put you into our shopping cart where you can read up on these suggestions. Additionally, there is a safety video on each page which goes over everything you need to know regarding the safe use and storage of these products. Lastly, though most everything you mention will prove easy to control using these suggestions, I’m afraid the springtails are the one pest that could remain a problem for a long time. To understand the complexity of this pest, read our article and the posts from customers. Basically they can be persistent because they live in the yard and the yard treatments can take several months if not a year or two before they get deep enough down to really thwart the local population. That being said, you should be able to manage the problem. Just don’t expect it to go away overnight. Hi, I have some booklice problems in my bathroom ceiling. Which product would be right for use on the ceiling? Most aerosols are directed to be used upright, so would the 565 or cykick aerosols still be ideal to be used spraying parallel to the ceiling? Also the cykick aerosol is ONLY for cracks and crevices and can’t be used on wide space such as a wall? If the cykick aerosol is ok for wide spaces (walls), would the residuals be harmful if touched after application? First, either product can be used. As our information above explains, the 565 will provide a quick kill and having used the can for many years, I know from experience you can direct the spray “upward” no problem. But more importantly, as a space spray it won’t matter. In other words, the coverage would be throughout the area whether you direct the spray up or not so it’s not vital to the success of the treatment; just treat the air space with the right amount of 565 and anything in the room will succumb to the treatment without having to take a direct spray. 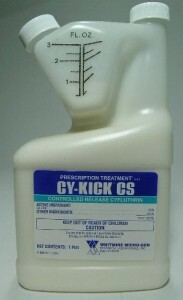 Second, the Cykick aerosol is for crack and crevice use but it’s also labeled for spot treatments. This is essentially “surface” treating. You can confirm this by reviewing it’s specimen label (we have a label link on the Cykick product page). So if it was my bathroom, I’d be using both. I’d use the Cykick first to hopefully get the area properly treated but then afterwards, anytime I saw a booklice, I’d do a quick spray with some 565 to make sure it doesn’t go off and continue nesting elsewhere. One of the advantages of the 565 is that it can be used as frequently as you want (even several times a day if desired) so it will prove handy to have around. But this is also a disadvantage because it won’t affect the “hiding” booklice. And this is where the Cykick can pay dividends because it will no doubt remain active for a week or two. Lastly, the area should be kept close and people should stay out of the room following treatments. I’d let it sit for a good 30 minutes but after that, if you open the door to the room and let the air circulate, there will be no hazard or risk to anyone wanting to use the room. And this would be true even if they touch treated surfaces. The reason for this is because if you apply the product properly, it will be so thin over the surface area that there can’t be enough material out to have an impact through dermal exposure. Furthermore, if this bathroom is like most (meaning it’s used for showering and washing), the high moisture levels will no doubt break down the treatments that much faster meaning the residual from the Cykick will be diluted much faster compared the normal breakdown time due to the high levels of moisture. You see, water ruins any pesticide and high humidity will make it useless much faster compared to treatments done in dry rooms. This is the reason why treatments with Cykick will only last 1-2 weeks compared to other areas of the home where it could easily last 3-4 weeks. I have a bathroom problem. Should I be using the 565 to kill off the booklice and then use the rough n ready to wipe the molding walls? Is it ideal to use the rough n ready with a pump sprayer in the bathroom? Rough and Ready will neutralize the PT-565 or PT-Cykick so you need to use it first. Now since most bathrooms I know are relatively small, I would say wiping down the walls, moldings, crack, crevices, etc. would be the way to proceed. Pump sprayers are generally only needed if you were treating say a crawl space under the bathroom. Or maybe a large cement area just outside the bathroom like a concrete walkway, patio slab or garage floor. Large areas like those would be where a sprayer would prove helpful. But in a bathroom, I’m sure it will only lead to over use. Now once cleaned, let the area sit for 2 hours to dry. Next, it would be best to apply PT-Cykick to all cracks and crevices because the booklice are no doubt living in these cracks and spaces. And if you have bathtub in the room, try to get access to under it in the drain trap. These are many times key locations where book lice will nest and forage. But the point here is if you’re able to treat these areas directly, you should be able to effectively take away their nest site and control the problem. Now since most bathrooms are small, using PT-565 shouldn’t be needed because again, I think you can effectively treat the entire room with just the Cykick. When treating several rooms or if the book lice are active on large, wide open surfaces, PT-565 is the way to go but in general, not needed for the average bathroom. I have read all of your suggestions, and I don’t want to make you repeat yourself, but I have found book lice in my bathroom up stairs, and in my daughters bedroom, which probably means they are all over upstairs. I have three small children and I want to know how to safely and effectively get rid if these things. I am sure they are in the carpet, and since our house is very small, we have things stored everywhere. My other biggest concern is, we get Pharaoh Ants and we were told not to spray for other bugs because this would break up the colony and make matters worse. So, I am really wondering how to combat book lice, without messing up the situation with the Pharaoh Ants. I don’t have the ants yet this year, but I have the proper bait, perhaps after two years of the professional bait, the colonies have died, but I am afraid to attract anything while killing these book lice. I have a springtail problem too, but its not an infestation, well it is outside, but I am more concerned inside right now and keeping cost low. Can you help me? Thank you in advance for your help. Second, springtails no doubt originate from outside and like book lice, will thrive around untreated structures. Now once they get established in these areas, it’s just a matter of time before they appear in the home. And the same is true for book lice. So for both pests, treating the outside can have a big impact on what you’re seeing inside. In other words, if you treat the outside thoroughly, you’ll be able to eliminate the springtails and book lice around the home and as a result of these treatments, eliminate them from inside the home as well. Now I mention this because you are concerned about spraying inside for ants. Well, if you review our Ant Control article, you’ll learn that in fact we definitely know spraying inside for ants is a “no no” and should be avoided at all costs. But in our article we also explain how important it is to spray outside the home to get rid of the outside ant colonies because in the end, all ants come from outside the structure. And like springtails and book lice, if you treat outside the structure, you’ll be able to stave off any getting inside so in the end, little if any treatments will be needed where you and family spend most your time. Personally I rarely spray in my home because I do 99% of my treatments outside. In fact, I was out in the yard yesterday treating around my home attacking some 3-5 ant nests that were getting established. I know if I let them live there, it would be just a few weeks before they started showing up inside my home and I just don’t want to bait or do any treating inside if that can be avoided. And treating them outside will no doubt avoid the inside treatments so I suggest you get with this program. In summary, if you start applying the Bifen Granules and spraying the Cyonara RTS around the outside of the home, you’ll take care of any springtails, book lice and ants that might be present. This will prevent any from getting inside and ultimately, treating outside is both the safer way to proceed and the more effective way compared to waiting till any pest has finally figured out how to get inside the house. And once you get your service company to do these outside applications or you start doing them yourself, you will free up the inside of the house from your concerns about using sprays in conjunction with ant bait. This freedom will let you knock out the book lice problem and ultimately, put in place a treatment regime which is outside away from the family that keeps the inside area pest free which to me, is the best way to proceed. We have a really bad booklice problem in our garage. What can we do since we can’t really control humidity in the garage. We are in WI. They are crawling all over everything, storage bins, toys, shelving, tools etc. Will they die off once winter comes around? To wash and clean everything in the garage just would not be possible and it would just continue to collect dirt. HELP!! This is an easy one since the area is small. As our article above explains, booklice are easy to kill. But because they can move in tight areas and get on things we can’t spray with liquids, they can be hard to treat. But the one formulation that works great on them is the aerosol we have listed above. So in this case, if you were to apply some PT-565 twice a day, you’ll kill them off and keep them from reappearing. If it’s a 1 car garage, all you’ll need to do is spray into the air for 10-15 seconds (with the doors closed so the treatment stays inside). Do this once in the morning and once at night, just before retiring. PT-565 uses nothing but pyrethrin as its active so its safe to use in these areas and won’t contaminate anything. Pyrethrin is only active for an hour or two and then it will all disappear making it ideal for such areas. Now if you find manually treating like this is too much work, simply install an aerosol machine with some Purge Pyrethrin refills. It uses the same active as the PT-565 but with these machines, the machine will be doing the treating for you. I’d get the Aero 2000 and set it to go off every 30 minutes. Again, this won’t pose a hazard to anyone using the garage. 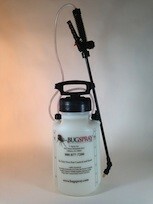 But its easy to deploy and will control all pests including booklice, wasps, mosquitoes, biting flies, gnats, etc. How do I kill any booklice deep inside my old books? They do smell musty since I stored them in a basement, in cardboard boxes. I had no idea the insects would spread throughout the house! I have small children and pets, so I like the fast depreciating 565, but I’m not sure it will penetrate inside the books which is where I have seen the insects. They are old, out of print books, so I’d hate to throw them away although at this point they are no longer valuable. I thought I could put them in plastic bags with your pesticides but it sounds like they could live inside the book and not have to come out to make direct contact with the poisons. Also, I saw one in my box of old photos. Do I have to try to take every photo away from it’s backing to treat them? Many photos are a hundred years old. What do you reccommend? No doubt the PT-565 could be one way to go. It actually comes out of the can in ULV sized particles which are very small. This means it can penetrate small areas and could do the job if you don’t have too many books to treat. But I have seen where a bit more is needed when the quantity of books is large so here’s what I suggest. So if you only have a hundred or so books, you could lightly mist some of the 565 onto every book, one by one, as you quickly “fan” the pages. This would insure some of the product gets inside each page and wouldn’t be too hard to do. Tedious yes but it would work. But if you have thousands of books, this might not be a practical way to treat. So if have that many, you could try to “contain” the books to get more treated at one time. This would also insure a more thorough treatment. However, you wouldn’t want to do this in a plastic bag like you were thinking. Instead, go with a plastic storage bin. Fill the bin with a layer of books and try to keep each book slightly “open”. If you set them with the book binder laying on the bottom of the bin, toward the floor, you could fit quite a few on end like this with the pages slightly open ready to receive the treatment. And if you have a big enough container, you should be able to fit 25-50 books per bin. Next, lightly mist over the open top of the bin for 10-15 seconds making sure the mist filters down onto the books inside. Don’t spray the books directly but aim at them. Next, seal the bin for 2 hours and when you come back, see if there are any booklice still alive. If not, this will prove to be an effective way to handle the problem and over the course of week or two, you should be able to get them all treated. But if you find the booklice are too heavily infested or if you have too many books to treat this way, you could opt for the Nuvan Insect Strip fumigation option. These work on a wide range of insect pests and are perfect for confined areas like a large garbage bag. Basically they slowly release a non residual active that will kill most any pest (including booklice). And if you were to fill a large thick plastic bag with books and then add one of the 16 gm strips, you’d be able to kill all the booklice in 1-2 weeks. Of course, keeping the insect strip in there all the time would insure the books weren’t eaten by any other pest either like roaches, silverfish, etc. Now the bags would have to be the thick, heavy ones like the “Husky contractor cleanup bags”. They’re 3 ml thick and have a holding capacity of 42 gallons. Don’t use anything smaller. And the strips will last a year or more so they’re perfect for long time storage. If you review our Booklice control article, you’ll learn that this pest generally starts by living on the outside of a building and from there, nests will begin to accumulate “into” the walls. Once in the walls, its just a matter of time before they’re being seen inside (which is what you have happening now). Unfortunately keeping a low humidity inside will not thwart the reproducing and successful nesting of those in the wall or on the outside of the structure. In other words, installing a dehumidifier will not have any significant impact on the problem. But the good news is this pest is easy to control. First, get the Cykick concentrate listed in our article and spray 2-3 gallons of mixed material onto the homes exterior. Be sure to focus around any areas which are likely to harbor booklice. Likely areas include under siding, shutters, around windows, door frames and basically in any visible crack or gap you see. Second, apply PT-Cykick aerosol to the entry point you’ve identified in your bedroom, along with any other crack or crevice you can find in this room as well as any adjoining rooms. The aerosol treatment will quickly kill any trying to come inside and this should provide instant relief from the problem. The outside treatments will effectively kill all other booklice and within 1-2 weeks, the problem should be gone. Lastly, even after they’re gone, you should retreat every 1-2 months to insure they don’t re-infest. Booklice are very active during the warm spring and summer months so you’ll need to treat at least during these months to prevent a new infestation. Mind you the Cykick works on a wide range of insects so it will be taking care of many other pests like ants, roaches, crickets, etc. that might happen to choose your home to nest. I have a new straw bale home. We live in rural Colorado at 7000 ft elevation. I am finding psocids all over the counter in one bathroom. A moisture meter was used on every single bale of straw showing it was under 14% humidity. Over the straw is cement and stucco. The psocids like the marble tiles and the grout on my bathroom counter. The counter is clean, the tiles and grout have been sealed. I can’t find where they’re coming from. We have even opened up the wall in a couple of places thinking that the bales were too wet somehow. The moisture content is now under 10%. I’ve looked under the counter, around the plumbing, on the walls and I cannot figure out where they’re coming from. I have killed literally thousands of these things. Got any ideas how I can find their nest in a new, clean, cement walled and stone countered bathroom? Permethrin knocks them down but they still keep coming. Thousands. It’s ugly. Over the years I’ve helped many people with pest problems stemming from straw when its used for construction like you’ve done in your home. And though its quite possible the initial booklice population came from some of this material, its more likely that once they got a foothold inside your home they learned how to sustain themselves without needing to move back to the straw. So at this time I believe you need to focus your attention on the inside living spaces for now. I say this because of how booklice live, migrate and sustain active populations. First and foremost, they don’t forage far from where they call home. And once they find a good nest site in the home, they’ll reproduce to the level that particular location can sustain. Now once this location gets “saturated” with adults, some will migrate looking to form a new nest. This migration may only be a few feet from the original spot. But the goal is to set up a new nest site or a new “pocket” of active members. And if this new pocket is successful, they will then migrate to another new spot looking to form a new pocket. Now in bathrooms I’ve seen them nest under water faucet handles, down the drain, under any water pipe cover, on the water pipes themselves in the wall, under the bolt covers that hide the toilet bowl mounting hardware, under the lid that covers the water closet for the toilet, down the tub or shower drain, in the faucet head or shower head, in the tile grout, in the over flow section of the sink and in many other areas as well. The point I’m making is there are a lot of areas in any kind of bathroom where they can easily hide and nest. So the way to deal with any kind of booklice activity in a bathroom is think about “pockets” or small nests. And using this concept, its easy to understand that any one room can have 10-20 such nests present. And even if you kill 90% of these pockets it won’t get rid of the problem completely because the few you miss will just repopulate the vacated spaces. So how do you go about solving the problem? Well the first thing to realize is that liquid spraying won’t do the job. The reason it typically fails is that liquids only cover the spots you treat. And since its not possible to cover all the spots where they might be nesting, you’ll need to abandon this form of treating. Especially when dealing with any kind of “wet” room like a kitchen or bathroom. But what will work is an ULV aerosol. This is because the particle size is so small it will permeate all the hidden areas in the room. And it can do so without making a mess making it the logical choice for sensitive and hard to treat rooms. So for any room where you have the booklice problem, treat with either PT-565 or better yet, an Aerosol Machine filled with Metered Insecticide. Both of these options uses pyrethrin as the active which works well on booklice. But because it has no residual, you’ll have to make sure its continuously “renewed”. So if you use the PT-565 for this application, you’ll have to manually renew it at least twice a day to get the problem under control. Alternatively, if you set up one of the Aerosol Machines with Metered Insecticide, the machine will do all the work since it can be programmed to go off once an hour. This way you don’t miss any treatments which no doubt can let the booklice come back. The key is the quick 1 second release of pyrethrin from the machine will do all the work quickly by killing off any pockets of booklice. And as long as the machine is kept running, they won’t be able to come back. Now is this a permanent solution? Maybe. You see, its entirely possible the straw had some booklice which moved into your living spaces. And once you kill off the booklice in the bathroom the problem might be over. So for now, I believe this is where you should focus your attention and not so much on the straw. Remember, even if they are somehow getting from the straw into the bathroom, using the machine will control any that enter so in the end, they won’t be able to get established inside anyway. And with the moisture of the straw dropping all the time, they’ll eventually die off in these voids and be gone for good. I live on the 17th floor in a condo. Last June I discovered that my kitchen drain was leaking and it caused the wooden floor to swell and buckle. After the repair I ran a dehumidifier for most of the summer. This Fall we noticed tiny bugs coming from the seperations in the floor wood tiles and in the corners around the baseboards. I assume these are booklice since I know the subfloor must have gotten wet and now moldy. I have tried filling in the spaces between the wood tiles with silicone to prevent the bugs from coming up and the humidity in my condo now is at 16% but they still are there. They are so small like the period at the end of sentence. I think I need to replace the floor but that is expensive- is there any way to get insecticide down into the subfloor? What else can I do? First, its generally never a good idea to try and use a sealant to control any kind of pest. In most cases, they will only persist and in the end, the sealant will many times get in the way of doing the proper treatment because it can effectively “block” the chemical you end up needing to use. That being said, I believe you can resolve this issue quickly and easily without having to make a mess. Now if you review our article above, you’ll see we list many products. But the one I’m going to recommend won’t be seen on in our article. In fact I believe you will get the best results using another product we carry called Phantom. I say this because Phantom goes on “dry” and is odorless making it ideal for use on the floor an in sensitive rooms like kitchens. This way you can treat without making a mess or having any kind of odor issue. Now Phantom is a special kind of product in that it doesn’t kill quickly; it actually takes 2-3 days to kill targeted insects so don’t panic if you see activity for a day or two following your application. This is perfectly normal and expected. But after a few days, all activity should cease as long as you treat all the cracks and crevices using the included straw injector we send with every can. And if you still see activity a week later, treat the active site again and you’ll soon be rid of them. I’m at my wits end… it all started back in the late summer of 2016. We were living in an old apartment building and started seeing booklice on all of our things… books, wooden furniture, walls, you name it. I was devastated and developed extreme anxiety… we got rid of almost all of our stuff, put everything in plastic storage and rode out the winter not seeing any really. Then the weather warmed up and they were back. I decided to move immediately due to the bugs. Which sucked. Here’s the kicker: we moved to a brand new constructed building and I’ve been seeing a few here, too!! I fear that we have brought them with us and that they’re never going to go away! I’m seriously losing it and don’t know what to do. I need help! I have a small child and pet and I worry about treatments/safety. Please have some answers for me!! Second, booklice exist on every structure so your method of “solving” the problem and removing your “anxiety” will not work. In other words, no matter where you move to, there will be booklice. Like springtails, they are very much an important part of the local environment and Mother Nature cannot survive without them. For that reason they will be found to some degree everywhere including the most dry arid regions of the dessert as well as the coldest northern tier states here in the U.S. The good news is that with a regular pest control treatment, they can be managed. And its easy. So in this case, I suggest you get at least some of the 565 and Cykick. Treat open areas with the PT-565 for quick control and the PT-Cykick into all cracks and crevices where they might be living. I also suggest you get some of the traps. A combination of these products can manage any population although in the long run, the liquid treatments might be more cost effective. But for now, start with the aerosol’s and see if they do the job. Also, my bed frame has a leather cover, and I see them crawling over it. What can I do to get them out of the leather?